A genus of three described species that, as Blackman and Eastop note, are arguably similar to Epameibaphis. Cachryphora all feed on Solidago, or goldenrods. I’ve been lucky enough to find two of the three species now. 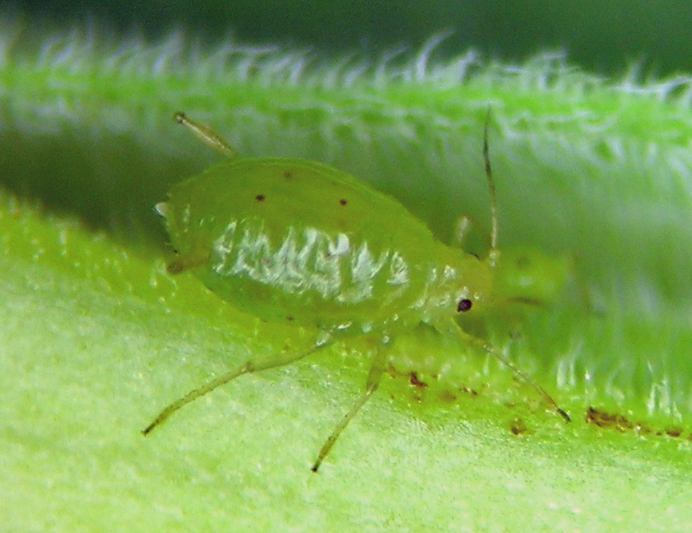 Finding this species for the first time several years ago near my then home-town of Moses Lake was proof number umpteen that even when I think I’ve collected in an area long enough to have found all the aphid species, I am inevitably wrong. I stumbled on this one feeding on a patch of Solidago that was growing among sagebrush (Artemisia tridentata) and greasewood (Sarcobatus vermiculatus) on the shoreline of Moses Lake. I suspect that the aphid lived in this situation because the shrubs provided good shelter from the wind. Cachryphora serotinae, I think this is the fundatrix.